The challenge of having a naturally positive attitude is the tendency to take for granted that things will always be smooth. It can be extremely sobering when you get a shot across the bow to remind you that, particularly where chemotherapy is concerned, you’re tinkering with the complex and delicate systems of the human body. Today, we recognized that shot. Even though Andrea’s receiving Neulasta injections (which help stimulate white blood cell production), subjecting herself to practical elements of an alkaline diet, jogging and exercising daily, avoiding (as much as possible) contact with people outside our immediate family, getting plenty of sleep and receiving regular energy treatments, her white blood cell and neutrophil counts have dropped significantly. Thankfully all is well and chemo number three proceeded as scheduled. 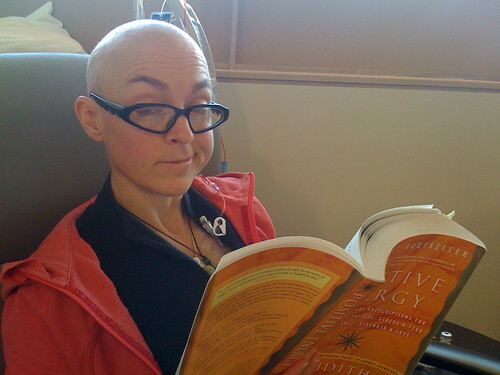 However, it was a revelation that we may yet face setbacks in Andrea’s chemo program. It was also a shock to consider what the situation might be like if the above list wasn’t true. Those thoughts rattled Andrea. We actually took a picture of Andrea in an unsettled state and had hoped to use it for this post since it was just as relevant a moment as any of our happy moments are. Unfortunately, it seems my iPhone had different plans as it chewed the photo up and spit it out when we weren’t looking. This is where having a naturally positive outlook is particularly important. Andrea and I talked about what the counts mean and we agreed that the counts are high enough and Andrea strong enough that she’s remained healthy to date. We also realized how lucky we are that we’re able to get Neulasta and that Andrea’s commitment to exercise and good health has played a key role in protecting her from even lower counts so far. I’m reminded of another belief I have which I sometimes forget: celebrate every victory, no matter how small. This simple approach sustains motivation and focus, and keeps away challenges that have the potential to overtake me. With that in mind, I’ll refocus my attention from finishing the sixth treatment as scheduled on April 2, to making sure Andrea stays healthy and can proceed with chemo number four as scheduled.